Takeaway: Our level of confidence is a prominent factor in our decision making. Reducing overconfidence through education and training can reduce the rate of workplace safety violations. We’ve all thought it before: “It won’t happen to me”. While this confidence may come in various forms, it’s often the cause of us arrogantly brushing off safety initiatives (see the Top 10 OSHA Safety Violations You May Have Committed This Year). And every time our confidence fuels the decision to not take even minor safety precautions, we’re actively choosing the option associated with the greater risk. Adam Kepecs, professor of neuroscience at Cold Spring Harbor Laboratory, believes that confidence isn’t just a feeling, but a scientific calculation used to make decisions. "The feeling [of confidence] ultimately relies on the same statistical computations a computer would make," Kepecs states. While we can't pinpoint the exact algorithm the brain uses to calculate confidence in our decision making, we do understand enough about it to know that confidence can inflate itself over time. When we don't experience a bad outcome from our risky decisions, we'll be more confident that things will turn out fine the next time we face the choice to follow or violate safety protocols. It becomes, in other words, easier and easier to make unsafe choices because those experiences made us overconfident. And that overconfidence, in turn, makes us underestimate the risks we face. 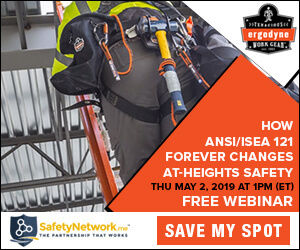 Jim, the safety manager at ABC Construction, stresses the importance of fall protection and fall protection training because he knows it’s needed for OSHA compliance, how many companies get cited each year, and how many injuries and deaths occur each year due to lack of fall protection. Knowing these things significantly lowers Jim’s confidence that not having any protection will negatively affect his company and its employees. Tom is a carpenter who also works at ABC construction. He has not rehearsed the OSHA standards, has never fallen, seen anyone fall, or even heard of anyone falling during his years in construction. Therefore, Tom has a high degree of confidence that he won’t fall and, as a result, doesn’t bother wearing fall protection equipment. Tom's been fortunate and his experiences make him feel like his luck will never run out. Jim, on the other hand, is more cautious because his knowledge gives him perspective. As a result, his behavior is more in line with the actual risks he and the employees of ABC Construction face. Knowing the role that confidence plays in decision making can help us drive home safety initiatives. It's important to have more than just safety procedures and standards in place. If those work well, they can still encourage employees to believe they are immune to safety risks. Safety professional need to focus some of their efforts of education as well (see 7 Superb Psychological Tactics for EHS Training for training tips). By making sure the facts about the risks, hazards, and dangers in their workplace and those like theirs are in the forefront of their minds, workers can keep their confidence in check and resist the temptation to ignore safety protocols (wondering how workplace hazards differ from dangers? See Hazards vs Dangers to find out). Ensuring everyone's safety is about more than just enforcing safety standards; it's also about educating the employees so they never forget why those standards were implemented in the first place. And the reason they're place? Because unfortunate and tragic events can happen to anyone—even you. Overlooked Jobsite Safety: It's Time to Stop and Think Things Through!